What is so special about the placenta? The placenta has long been thought of as a magical part of the creation of a baby. This incredible organ is uniquely designed for your baby and an integral part of any pregnancy and birth. 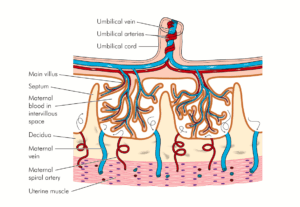 The placenta physically connects the mother to her unborn baby, feeding the developing fetus a continuous supply of essential oxygen, nutrients and vitamins through the umbilical cord. During and after birth women lose 1/8-1/10 of their blood supply from the bleeding wound left inside the uterus, where the placenta was attached for 9 months. As is true with most mammal species, we believe the human placenta was made to be consumed by the new mother to make up for this loss by replacing essential fats, proteins, vast amounts of iron and essential hormones to heal wounds and aid the body in self-recovery after birth. With pharmaceutical companies and hospitals around the world researching and developing new forms of medicines from donated human placenta to treat a vast array of disease we feel new mothers deserve the option to make use of their own placenta for their own healing after birth. Below: Abstract from a research hospital in Switzerland that has been experimenting with human placenta as an injectable medicine to help patients with degenerative diseases. Why should pregnant mothers consider consuming their placenta after birth? Dried placenta powder was recognised as a potent medicine in Europe for centuries and used to treat and cure many ailments, mostly those surrounding birth. However since the late 19th century most natural birth methods were replaced by modern birthing techniques, losing along the way many valuable traditions practised for centuries. The benefits of consuming the placenta are being rediscovered and scientists are beginning to study placentophagy in humans. Testimonials from many new mothers reveal that consuming the placenta after birth helped improve energy levels, increased milk production and slowed or stopped post-birth haemorrhaging, creating an overall healthier and quicker post-birth recovery. Read through our collection of scientific studies and articles supporting placenta encapsulation and other placenta remedies. Do all mammals consume their placenta after birth? Yes, almost all land mammals consume their placenta immediately after the birth of their young, except for marsupials who re-absorb it, sea mammals and camels. Our closest relative, the chimpanzee has only been observed giving birth a handful of times in the wild (chimpanzee’s do not reproduce very well in captivity). During each observation, the new mother was seen to consume her placenta within minutes after its birth. 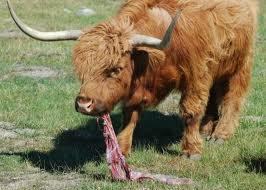 Mammals are thought to consume their placenta for a number of reasons. It’s important to notice that mammals do not bleed after birth, (humans bleed for 2-6 weeks) and their milk ‘comes in’ within hours after delivery (humans milk takes 2-3 days to ‘come in’). Mammals are observed to have pain-free births with a very short and easy post-partum recovery except for humans. Could the missing link be the consumption of the placenta? Do humans have the same benefits as other mammals when eating the placenta? In a blender, place all ingredients. Whirl on high until smooth. Makes 2 servings. 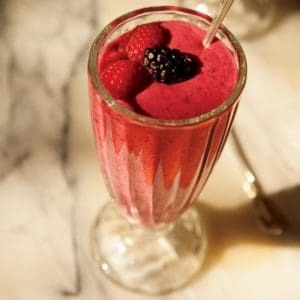 Enjoying a raw placenta smoothie made with fresh organic berry fruits as soon as possible after birth is the most natural way of consuming the placenta. Raw placenta smoothies may help stop post-partum haemorrhaging and give the body an immediate boost of hormones, protein and iron much needed following birth to slow bleeding and encourage milk production. Haemorrhage is the single leading cause of maternal mortality. When the placenta separates from the uterine wall it leaves a large wound that leads to average blood loss of >500ml (half a litre) to 1000ml in the first 24 hours after birth. This wound can take weeks to heal hence the average post-natal bleeding time of 3-5 weeks, especially if the new mother is breastfeeding after a particularly traumatic birth. When the placenta is consumed many new mothers have reported having almost immediate reduced bleeding, spiked energy levels and thick breast milk much sooner than predicted. See our testimonials page, where mothers have shared their experience with placenta smoothies. Once the placenta has been dried and made into capsules it is thought of as a form of medicine and will have different benefits than eating the placenta raw. Even through the cooking process iron, hormones, nutrients and rich growth factors are thought to be present in the placenta capsules – all of which support a new mother’s body through the post-birth recovery period. Read more about the powers of Rich Growth Factors. 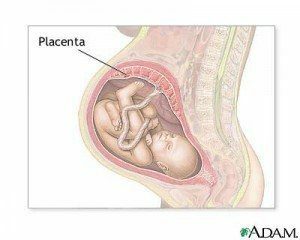 What other nutrients are found in the placenta? Stem Cells – stem cells are the body’s master cells and can transform into almost any type of tissue – from brain cells to blood cells.